Septic systems are mainly used in rural areas where access to public sewers is either unavailable or would be prohibitively expensive. If your property uses a septic system, then you need to register with the Environmental Protection Agency and you are responsible for ensuring that your system is functioning properly. However your local authority has a duty to ensure that the septic tank is adequately maintained, and in situations where it considers the tank is causing a nuisance or a risk to public health, they can insist that you carry out repairs. 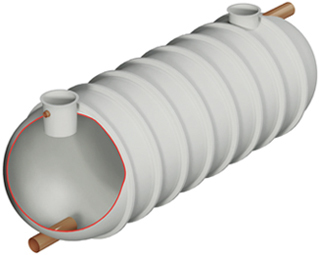 A septic system is a small scale sewage treatment works, whose purpose is to treat the waste water (effluent), returning it to the environment, while storing the solid waste (sludge). Each time you turn on a tap, flush the toilet or use the washing machine, the waste enters the septic tank through the inlet pipe. Here, the heavy waste sinks to the bottom, the light waste floats to the top, forming a crust, and the effluent remains between the two layers. The term ‘septic’ refers to the anaerobic bacterial activity in the tank which decomposes the sludge at the bottom, reducing its volume. Each time more waste flows into the septic tank, some of the effluent is pushed through the outlet pipe of the septic tank and into a closed network of perforated pipes that is laid out in the drain field on a bed of rock and gravel. As the effluent filters through the bed and into the soil below, aerobic bacteria eliminate the remaining impurities, and clean water percolates back into the environment. 1) Septic tanks need to be periodically emptied to remove the sludge that has built up over time. This is usually done once every twelve months, however, the frequency will depend on variables such as the size of the septic tank, the number of residents using the system and ambient temperature. 2) A septic system relies on a delicate ecological balance, so you should be conscious of the chemicals you introduce into this system. Reasonable amounts of household detergents and cleaning fluids will not cause a problem, but hazardous chemicals such as varnish or paint thinners will. 3) Most septic system problems are caused by blockages. Items such as nappies, sanitary towels or facial tissues will very quickly clog the septic tank. Instead of flushing these items, bag and dispose of them with your rubbish. 4) Avoid pouring fat or grease down the drain as this will build up in the pipes and septic tank, or flow through to the drain field where it will clog the soil. 5) Ensure that trees do not grow near the septic system as their roots can damage and block the pipes. 6) When planning landscaping or house improvements, ensure that rainwater is diverted away from the drain field to prevent overloading it. A properly designed and well maintained septic system will provide many years of reliable service. Whether you need repairs to an existing system or are looking to install a brand new one, Wildon UK are the experts to call. We specialise in sewage and drainage solutions for both domestic and commercial properties and look forward to discussing your needs.